Since I was little I’ve always had the chance to share my life with dogs. When I was born, a very sweet Pomeranian, was already part of my family, maybe because of my mother wish, as my father had preferred bigger size dogs. I think that living and getting older with animals, dogs especially, may help in a huge way to create a sensible part in every human, and I think I was very lucky, that it happened to me. I was born in Arezzo and I still live here, and one day by chance, people from my country make me aware of a place called “Il Calcione”, just a few Km away from my house, and exactly there, a few years ago, was a very well known dogs breeding of italian greyhounds. Generally speaking, I’ve always liked the sweetness and the exuberance, the intelligence and the liveliness, the marked sensitivity, the grace, the gentle harmony of the shapes, the good looking and athletic body. As a lover of greyhounds, I couldn’t not be in love with the Italian greyhounds! I was enchanted and bewitched by infinite and difficult history of this race, and as soon as I’ve moved away from the city centre to the country side, with my wife Elena, we’ve decided to welcome our first Italian greyhound in the family. 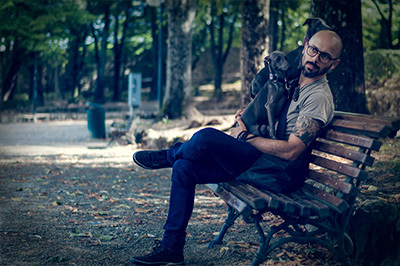 The strong passion and the wish to share it with other people, has convinced me, since the first moments, to attend to some Show expo around Italy, and this has been a good opportunity to meet other dog lovers and to see many italian greyhounds, and be able to study all their differences. The reached goals, and especially the ones not reached, have encouraged and incentivized me to learn always more the deepest characteristic of their behavior and their technique in order to value the race. I’ve also attended to different kind of specific Masters for dog breeders promoted by Enci, Seminars and Workshops organized by dog experts. Since that time, my passion has grown up every day more and more, and the contagious enthusiasm of these little animals make me begin to breed them with respect, passion, and professionalism, using the plate of Etrurian Velvet. From January 2014 to September 2016 I have been the counselor of the Italian Greyhounds club of Italy and from 2016 I'm counselor of Gruppo Cinofilo Aretino.